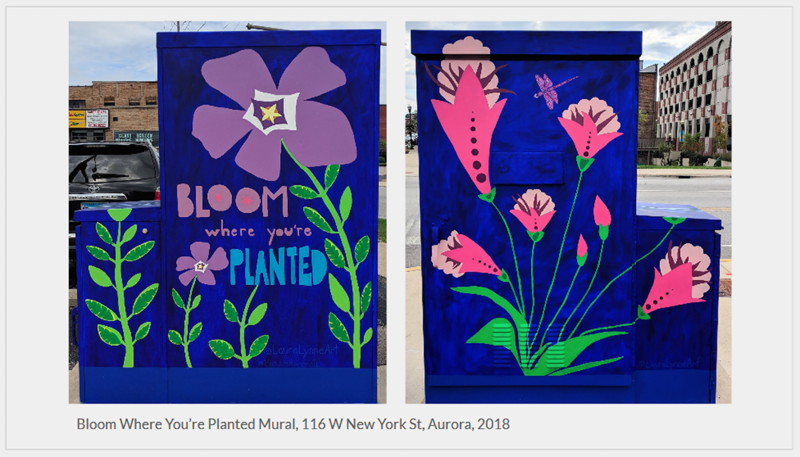 I chose the “Bloom Where You Are Planted” design for the utility box mural in downtown Aurora as a message of love and hope for the community. There are so many people working to make Aurora a better place to live, and it seems to be working. The downtown has changed dramatically since we’ve moved here in 2008. The musicals at the Paramount are incredible, the new murals have really brightened and livened up the city. Public areas are being remodeled and some excellent restaurants and coffee shops have moved into downtown. Beautiful butterfly gardens dress up the streets. Aurora Downtown, city workers and volunteers help to host fun free events, like First Fridays, Alley Art Fest, and others. I hope my mural has added to the positivity going on in downtown Aurora and that we see even more growth and roots here. Over ten years ago I moved to Aurora, IL from Milwaukee, WI. I had lived in Wisconsin for 30 years before moving to Aurora, owned a home, had a good job, and felt very connected to my community. Aurora is growing on me, however, there are many things I miss terribly from my previous home state – the nature, lakes, parks left mainly in their natural state, and living closer to my family and friends. So, I made the art to remind myself to be present and thankful for what I have – to work on making our home a nice place to live, planting a literal garden, and to work on making friends and connections here. If you are interested in a mural indoors or out, please contact me to arrange your free consultation today.